Scott Wilkinson is a Colorado native and graduate of both Colorado State University (with a B.S. degree in civil engineering) and the University of Colorado School of Law. He joined Davis & Ceriani as a law clerk in 2003, became an associate in 2005, and a partner in 2011. Mr. Wilkinson’s coverage practice involves representing and advising insureds in disputes with their insurer(s), particularly in complex commercial cases and cases involving concurrent and/or layered insurance coverage. He has served as lead counsel in a number of insurance coverage suits/disputes involving six and seven figure claims, has helped his clients recover millions of dollars in policy benefits, and has obtained substantial six and seven-figure recoveries on claims for unreasonable delay or denial of policy benefits. Mr. Wilkinson’s practice includes pursuit of insurance coverage claims both inside and outside of Colorado and his cases have given rise to three leading US District Court decisions concerning the obligations of an insurer to an additional insured. In addition to insurance disputes, Mr. Wilkinson has litigated everything from securities fraud, construction defect and employment matters to contract and property disputes, personal injury, negligence, breach of fiduciary duty and misrepresentation/omission cases. His experience includes representation of both plaintiffs and defendants before a variety of state and federal courts and in arbitrations and mediation proceedings. As part of the Davis & Ceriani trial team, Mr. Wilkinson has assisted clients in achieving six, seven and eight figure settlements and verdicts. Mr. Wilkinson also has significant appellate experience, having briefed and argued appeals before both state and federal appellate courts. Mr. Wilkinson’s coverage practice also enables him to conduct insurance policy reviews and counsel clients on various aspects of their insurance schemes. He also advises clients in a variety of other business contexts including business structuring, business agreements (e.g., operating, distribution, contractor/subcontractor agreements, etc. ), employment and risk mitigation matters and negotiated partnership/business buyouts. 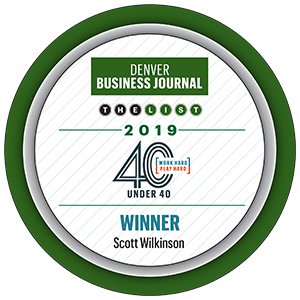 Mr. Wilkinson was honored by the Denver Business Journal as a 2019 40 Under 40 winner (see the article here) and has been selected as a Colorado Super Lawyers Rising Star every year since 2013. Mr. Wilkinson also writes and gives presentations concerning a variety of contracting and insurance coverage issues and has testified with respect to legislation impacting construction and insurance issues (and affordable housing in particular). Mr. Wilkinson is also a two-term past President of the Board of Directors of the Ranch Country Club (where he oversaw a multi-million dollar renovation of the Club’s facilities), has served as part of the Boettcher Foundation Coaching Corps (where he was trained to provide coaching to Boettcher Scholars and Investigators) and volunteers for the First Tee.